Would You Put Your Baby In This? The Recycled Cardboard Cot. I am not sure I would, but hey, it’s quite an idea. 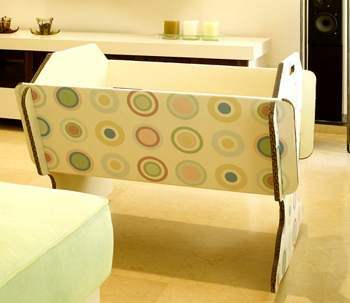 This cot is made entirely from recycled cardboard and of course, is completely recyclable at the end of it’s life. It is high enough to be right at regular bed height, making it easier to watch your baby at night. The crib actually looks quite sturdy, probably not for a 25 lb toddler. But as a bassinet for babies before a year old, it’s probably quite alright. Actually, corrugated cardboard can be quite sturdy if assembled properly. I had a project in late elementary school to design and build a usable cardboard chair, and we then presented them. I ended up with a fully functioning kid-sized rocking chair. After that experience, I’d probably be just fine with it assuming it stillseemed stable upon seeing it in person. We are thinking of using this Stacey when we do have kids…seems other people think they would be ok too!